Harry Potter & the Vegan Treatfest. After 10 years on the big screen, the Harry Potter series has finally reached its end. To commemorate such an epic event, I decided to host a small gathering of friends/fans. I invited everyone over a few hours before we would all have to leave for the midnight showing. I provided drinks and desserts inspired by the magical series. 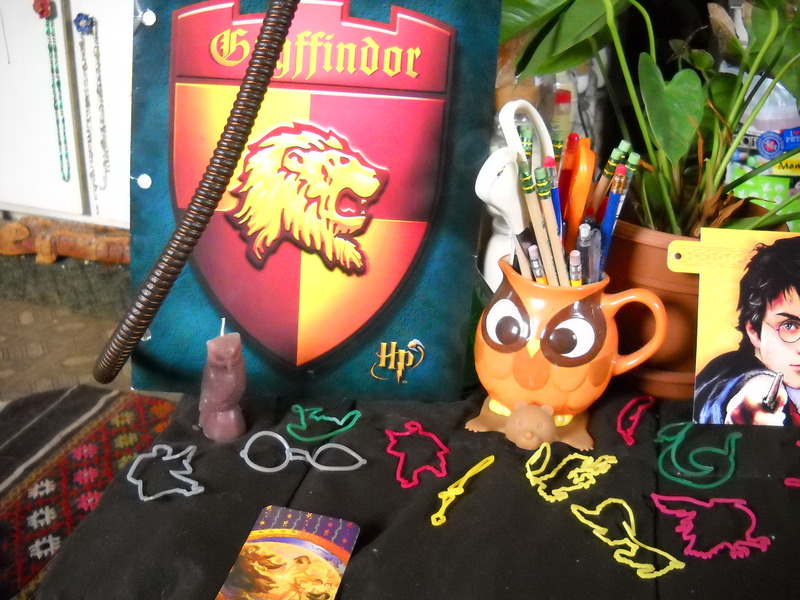 My super amazing friend Galen gave me the little Potter themed rubber bands to help decorate my table. 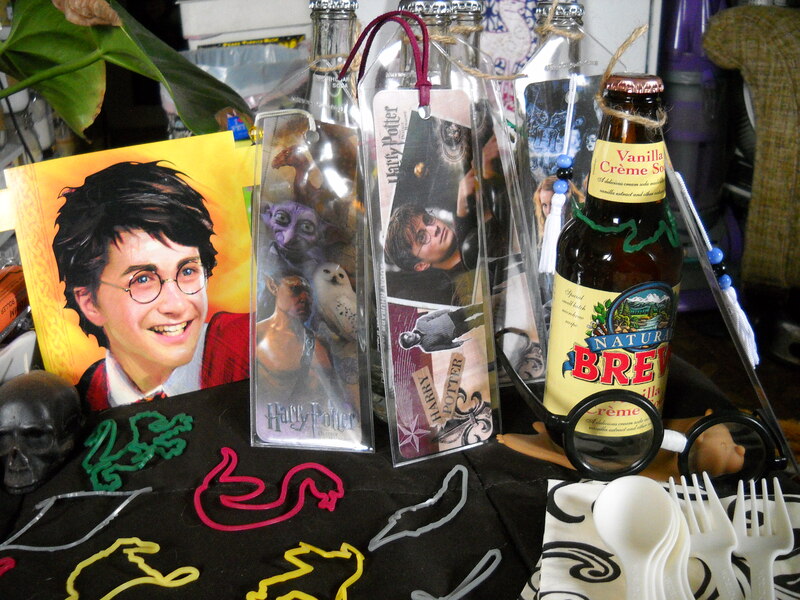 I also got some HP book marks and tied them to various natural sodas for each guest coming over. For the Golden Snitch Cupcakes, I did a moist yellow cake that I made extra yellow golden by adding my good friend Turmeric. If you and turmeric are not friends yet, you guys should sit down and get to know one another over some vegan egg salad. The Pumpkin Pasties are seen on the left and Hagrid’s Rock Cakes (my personal favorite treat of the night) are on the right. Pumpkin pasties are so easy to make. We should all be eating them, all the time. I have made them a few times and think I have finally gotten them just the way I want them. What you want to do is make a thick pumpkin filling by using organic canned pumpkin blended with your thickener of choice. 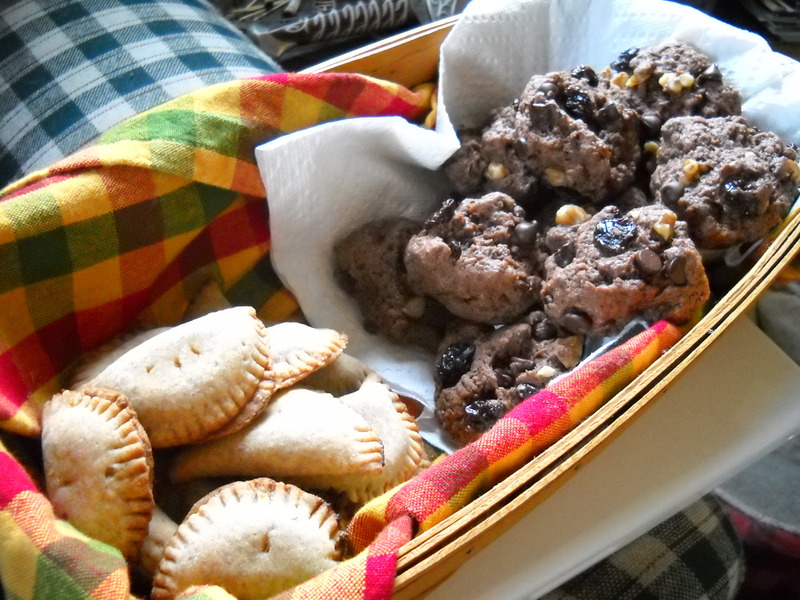 I like to use soaked pecans and arrowroot, but you can do whatever combination or single ingredient to your taste. Then you want to add a little sweetener of choice and to your taste- I don’t think pumpkin generally needs a ton of added sweetener because it is already so delicious and sweet as is. Pumpkin is also SO good for you it’s ridiculoos! But I’m going to save my pumpkin lesson for a pumpkin themed post later this fall when they’re in season and I become obsessed with them. 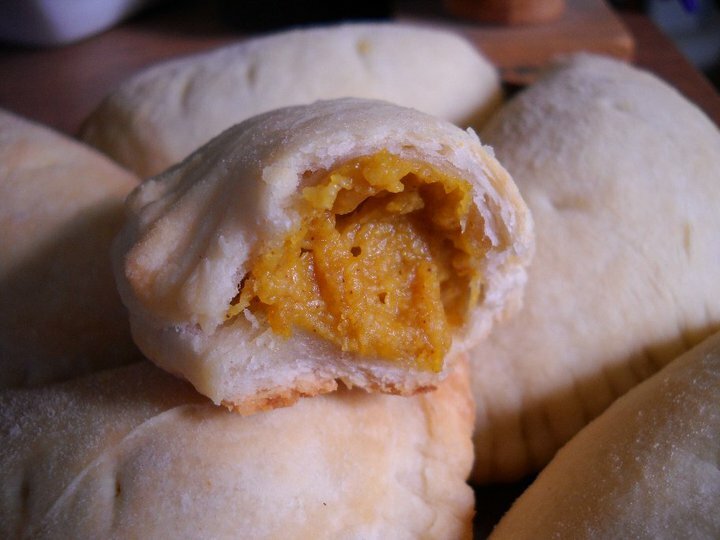 Anywhooo, just add some spices to taste and there you have it…pumpkin pasty filling! The next step is to grab some pie dough, which I hope you made yourself…..and get to pasty making. 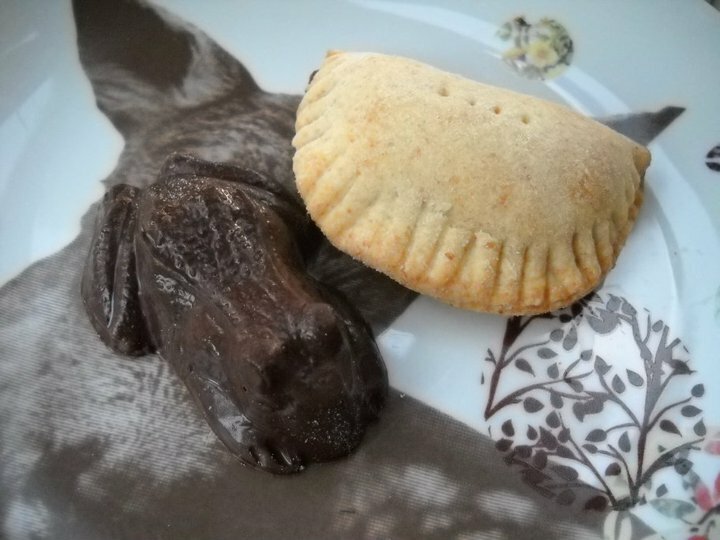 I make mine empanada style by rolling out my dough and using a biscuit cutter to make small circles. If you don’t have a biscuit cutter or round cookie cutter, grab a pint glass from the cupboard and use the top part as a your cutter. Give your cut circles one extra roll with your rolling pin, add a tsp or two of filling, fold and press the edges together with a fork. Cut a slit in the top for steam, then bake and bam, pasties in your face! Unfortunately, I didn’t get any good shots of the cauldron cakes or drinks. The cauldron cakes were mini chocolate bundt cakes with a chocolate ganache. Whenever I am having people over for food, I always forget to take pictures. I think it’s because I just get so happy to see my awesome friends that I just forget about everything else. The gathering was marvelous and the film was good too. There were some things that I didn’t exactly like about it, but overall I think it was great and that they really did do the best job they could with converting those amazing and magical books into films. I’m sad to see it end, but now we can all just look forward to a dvd party?!? If you’ve read the Harry Potter book series, which is your favorite book? Which film is your favorite? Do you think the films do right by the books? Lauren the treats look amazing and I am sad I missed out on it! I am sure they were delicious too! I’ve read all the books including Fantastic Beasts and Where to Find Them, Quidditch Through the Ages as well as Tales of Beedle the Bard. Sorry call me a bit of a film snob but I rarely see movies based on books with the exception of the Lord of the Rings series I had to see it as I grew up reading the Lord of the Rings series…. My favorite Harry Potter books are: Chamber of Secrets, Prisoner of Azkaban, & Order of the Phoenix as well as the Deathly Hallows as it ends with an wonderful epilogue! What are yours? Favorite characters? Wow….sad I wasn’t able to make such a treat filled night. While I am probably the only person on the planet who hasn’t read as much as a page of the books or seen any of the movies, it seems like you did an awesome job of paying homage to the series. What kind of frosting is on the golden snitch cupcakes? And those rock cakes look UNREAL! So sad you guys both missed it! I saw the first 3 movies before I had read any of the books, so I may have had different feelings if that situation were reversed. Generally, I would agree that film versions are never really as good as books. There is always something that fails to translate, although The Lord of the Rings is pretty outstanding, despite some of the major changes they made. LOTR are probably some of my favorite books and movies of all time. As for Harry Potter, I always did like and believe in Professor Snape. His life was sad, but he sacrificed so much for Harry and ultimately the greater good. And who doesn’t love Dumbledore? I like The Prisoner of Azkaban, The Goblet of Fire and The Deathly Hallows and oddly, those are also probably my favorite of the films, although I enjoyed Part 1 of The Deathly Hallows more than the conclusion. 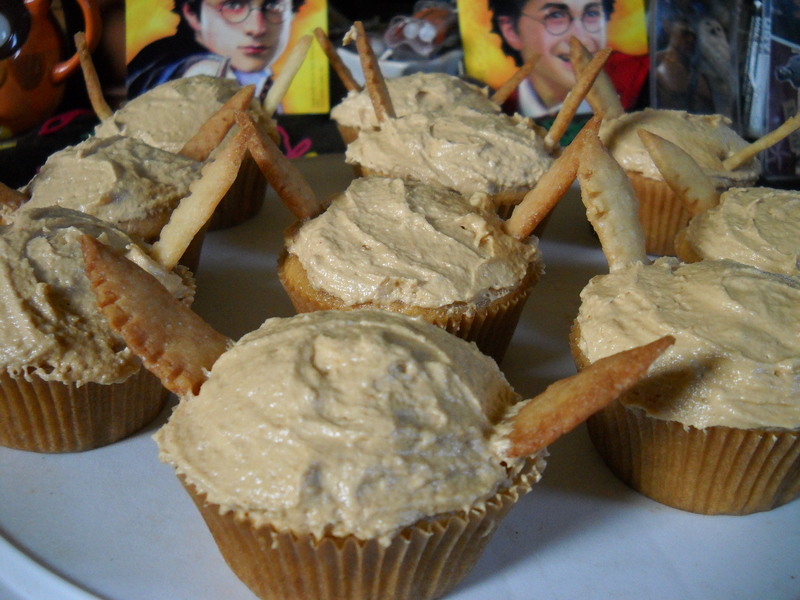 I gave the golden snitch cupcakes a peanut butter frosting. And Bess, you should give the books a try! Most of them read pretty fast, but there are 7 of them and a few toward the end there are pretty long, but I totally loved the series as a whole. They’re the kind of books that are difficult to put down once you start reading them. This was such an amazing night that I was so fortunate to be part of. Loved every single goodie you made. I am always so impressed by your talent, creativity and stickler to details. I felt I was transported to Hogwarts! I have read 6 of the 7 books which is just stupid, really. Loaned the 7th to an old friend and never got it back. Boo. So I am not entirely sure how the last movie compared to the book. I definitely feel the need to re-read all of the first six and continue with the 7th. Sounds like a plan. But I love Hermione; she’s definitely a fave of mine. Love that a girl is often getting the boys out of trouble. And I always had a soft spot for Snape. Was nervous for a minute there, but he proved that my soft spot was not misplaced. I am sad that an era has ended:( PS–a DVD party sounds like a plan!